Native Tucsonan Jim Ronstadt has been involved in sports since he was four years old and played baseball in a vacant lot. He was a three-year letterman in football (All-City 1958) and track at Salpointe High School. As Director of Tucson Parks and Recreation Department, his responsibilities included overseeing the management of five golf courses, 24 swimming pools, tennis courts and recreation centers. His advocacy resulted in more youth sports programs, including the award-winning Junior Golf Program which is offered free of charge by the City of Tucson in partnership with the Tucson Conquistadores. The Park and Rec’s nationally acclaimed tennis program, also co-sponsored by the Conquistadores along with the Tucson Parks Foundation and Southern Arizona Tennis Association, is another success story. Among his many achievements, this UA graduate and member of the Tucson Conquistadores was chairman of the 1991-92 Tucson Fiesta Bowl Committee; chaired the 1989 Valley Bank Fiesta Bowl Basketball Classic; was chairman of the 1995 Northern Telecom Tucson PGA Open; and was assistant chairman of the 1996 PING/Welch’s LPGA Championship. 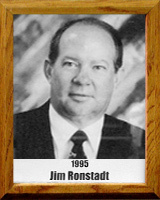 He was the 1995 Tucson Chamber of Commerce “Man of the Year.” Jim is a member of the Arizona Baseball Commission and the Golf Course Superintendents of America.